Created an ADF Application which has two pages. This will be deployed before the Iframe Application. 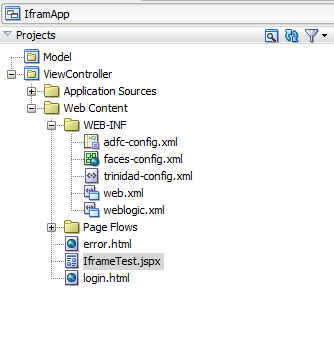 Now lets create Consuming Application having Iframe which will be used to display TestPage1 and TestPage2 in Application20 inside it. 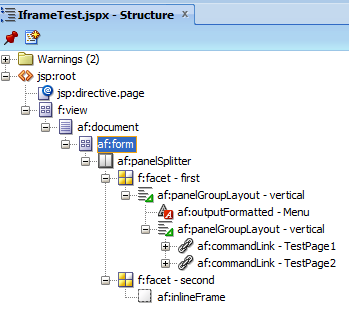 IframeTest,jspx has two menu items as well as af:inlineFrame component. The code is as below . The page - IframeTest has been divided into two panels using panel splitter. On left hand side there are two commandButtons which have actionListener as a method in managedBean. 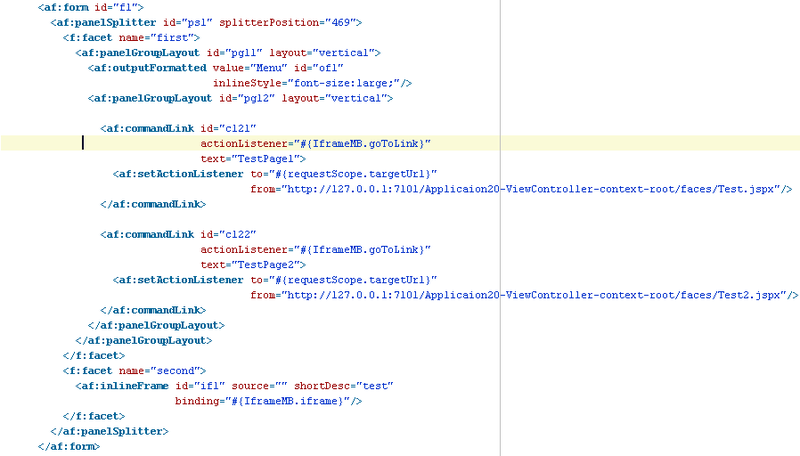 setActionListener sets the value of URL of TestPage1 and TestPage2 jspx into requestScope.goToLink . Below is the code for ManagedBean. Lets first run the Application20 webapp. Run the TestPage1.jspx. Now after it run the page, IframeTest.jxps in IframeApp application. Click on TestPage1 menu on left, The TestPage1.jspx (From Application20 adf application deployed) will open on the right in IFrame. Same happens if we click on TestPage2, TestPage2.jspx is opened. Its a very good post..Its solve my SSO problem for multiple application.. Thanks Tuhin. Glad you liked !! @Tuhin How can it solve the SSO problem ?If the other app url is protected, then the iframe will automatically redirect to login page right if SSO is not enabled between called and calling apps(As the both sessions are different). Hi Subbu, It has nothing to do with SSO. @Tuhin was just referring one of the problems which consist of multiple application access using single application in Iframe. Also to answer your question, If the called and calling apps will be deployed on the same domain , then if a user is logged in into calling application, weblogic will get jsession id in cookie and will keep the user authenticated in called application also and there is no need to re login. "To display this message Firefox must send information that will repeat action(such as a search or order confirmation) that was performed earlier." and parent session becomes null. When the the request is sent using http, we dont see any issues. Can you please suggest if we need to set any paremeters to address this issue? When you say parent application you mean the landing application ? It is not rendered in IFRAME? Kindly please provide more details. Yes. The calling application is the parent application. 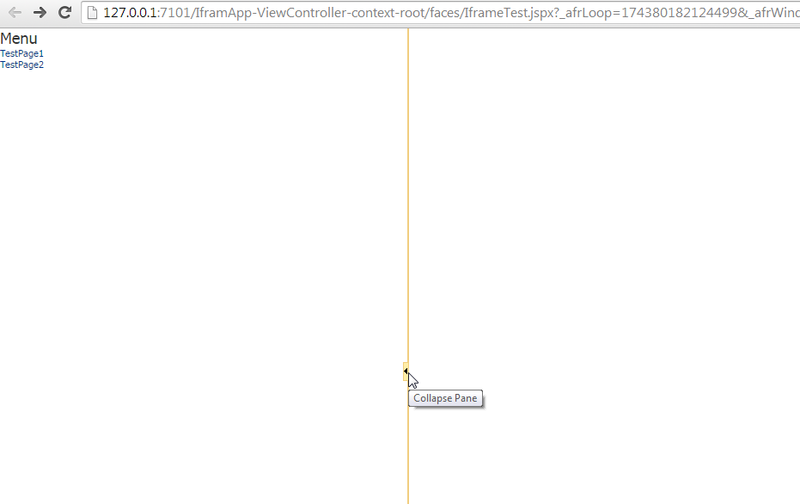 The called application is in inline frame. For example, we have 2 ADF apps(A & B). 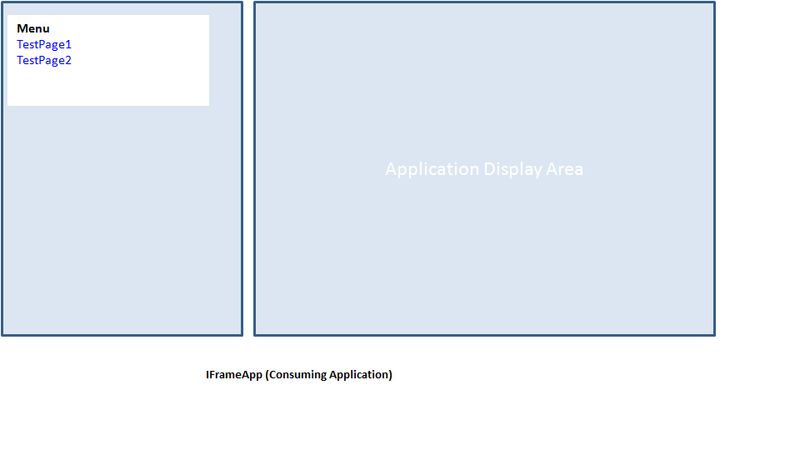 App A is the landing application that has the inline frame. 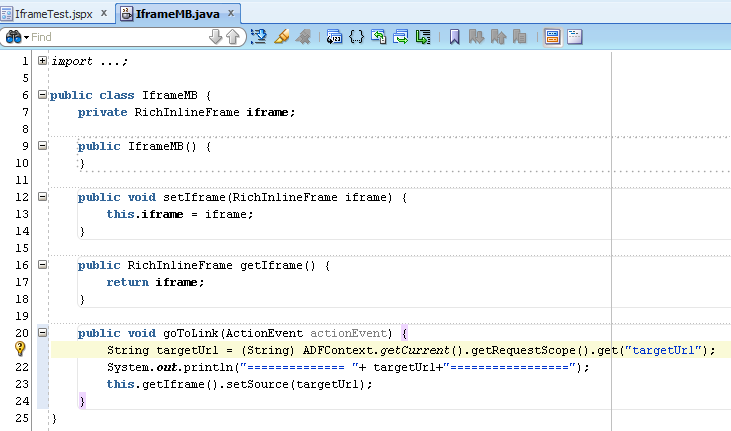 From App A, App B is called through inline frame. We have a left side tree in APP A for navigation and right side work area that is designed with inline frame. When user clicks on any of the menus from the tree, the work area should launch different ADF apps in line frames. When APP A is accessed through https request, after clicking on a menu from tree(one of the menus is configured to launch App B), the ADF B app is rendered in inline frame but on browser(Firefox) we see a popup with messgae - "To display this page, Firefox must send information that will repeat any action (such as a search or order confirmation) that was performed earlier." with Resend and cancel options. When clicked on 'Resend', it throws me back to the login screen. This happens as the session object becomes null. For the same use case, if APP A is access through http request, everything works fine and we dont see any issues. I FRAME is not recommended in ADF.What you would say?